For the Wein bridge oscillator elsewhere on this site the FSD would be set to about 2.5-3V RMS. If the meter shows any significant movement at low frequencies then some capacitor damping may be required. The scale will require calibration. The 470K resistor may be adjusted if the meter shows any indication with no input signal. The input capacitor will be determined by the lowest frequency of operation so start with 100n and increase if required. If an AC signal is rectified and applied directly to a meter, the scale calibrations will be increasingly non-linear as the signal is lowered in amplitude and will also be dependant on the conduction threshold of the rectifier device - typically about 650mV for a silicon diode. If the detector and meter circuit is inserted into a negative feedback loop then the non-linearity will be significantly reduced and with sufficient open loop gain will be neglibable. 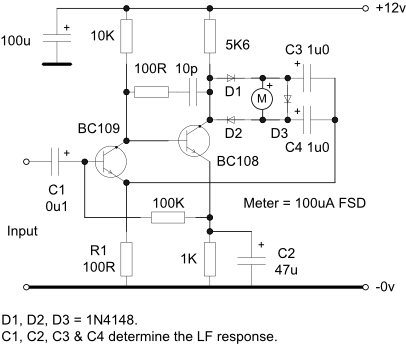 The following circuit shows a linear meter rectifier that makes a good building block for an AC milli-voltmeter and will work from 10Hz to at least 100Khz. The DC supply should be well smoothed and preferably regulated. The open loop gain (measured with the output below the conduction point of the diodes) is of the order of 70dB. As the input impedance of this circuit is not particularly high, it is proposed to use a MOSFET pre-amplifier in front to increase the sensitivity to 1mV FSD and the input impedance to 1Meg in parallel with about 10pF. 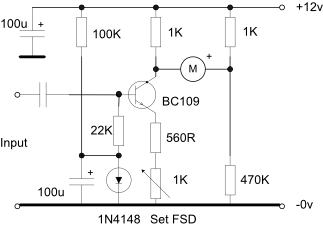 To use this circuit as a level indicator for an AF oscillator the output of the oscillator will need to be attenuated significantly using a stable resistor network. This circuit may be used to indicate the output level of an audio oscillator. The 1K collector resistor will be determined by the sensitivity required and the meter full scale deflection current. The transistor is brought just into conduction by the 1N4148 diode network and the meter reading is approximately proportional to the input voltage - note that it is not completely linear at the lower end of the scale. Full scale sensitivity is set by the 1K emitter potentiometer and for the circuit shown 2v RMS is required for FSD with a 100uA meter.